Decide on the amount you want to spend, the platinum product you would like to accumulate and how often you want to do it. The amount of platinum you will buy each time depends on the markets and will include partial ounces, which are hard to mail so fractions are carried over to your next purchase (See Note 1). You will receive your platinum in the mail a few days later. No hassles, you can stop at any time and change your plan product and/or amount whenever you choose. Cash prices are 4.5% less than the online (credit card) price, a Platinum Purchase Plan can be set up with Cash pricing several ways- ACH electronic payments direct from your bank account, using your bank's BillPay service, or you could manually mail a check each month. Please Email Us today for more information or if you have any questions. IMPORTANT: After you have completed the payment setup on Paypal, email us with the exact platinum product(s) you wish to receive. Select only ONE platinum product per plan. If you want to change to a different item later, any fractions of platinum on account will be credited to your new choice. Keep in mind that if you are sending the minimum you will only receive a shipment every few months. The platinum you have paid for belongs to you, we just cant send you a coin/bar until you own the whole thing! You select the amount you want to spend on platinum each time and choose the product you wish to purchase. If your preference is unavailable you will be contacted before anything is shipped for an alternate choice. On the same date each period your bank account, credit card or Paypal account (See Note 3) will be billed for the amount you choose, your platinum will be purchased at the current price (See Note 4) and mailed on the next shipping day. If nothing is being sent out you will receive your invoice that month by email. Fractions will be carried over to the next period. If you decide to cancel your subscription eligible remaining fractions (See Note 5) will be repurchased by Montana Rarities. Once you have subscribed it is easy to change your periodic purchase amount, or the type of bullion you are buying. If your subscription is funded through Paypal and you wish to increase it the maximum amount Paypal will allow is a 20% increase. Select the new amount above and click the "Subscribe" button. You will be taken to Paypal's website to confirm your changes, which will be effective on your next scheduled purchase date. Note 1. Fraction Accounting- Purchases based on a fixed dollar amount will result in partial coin/bar(s) purchased. Whole coins (or bars) will be shipped, leftover fractions will be carried over to the following month. You own the metals you have purchased but obviously we can't ship them until a whole coin/bar is purchased. Platinum ounces will be calculated to 4 decimal places, 0.00005 will be rounded up to 0.0001. Platinum coin/bar shipping increments will be based on the net platinum weight contained in the product you have selected. Note 3. To be able to sign up online you must use Paypal but you can choose to have the subscription settle against your credit card, your bank account or your Paypal balance. Keep in mind that Paypal charges us a fee for any transaction they touch, so if you plan on paying out of your bank account, talk to us about electronic payments or using your bank's BillPay service so you get the cash pricing! Note 4. Sell prices for the Purchase Plan are the prices published on the Montana Rarities website at 10 am Mountain Time for the product you have selected. Payments made with Paypal or by electronic transfers are processed the same day, mailed payments the day after receipt. Credit Card or Paypal funded purchases pay the Online price, check or ACH electronic payments pay the Cash price. Note 5. If your subscription is canceled before the 4th sale is final any carryover fractions may be forfeited. Platinum fractions eligible for refund will be repurchased by Montana Rarities at our regular buy price as published on the website. Refund will be paid by either Paypal or check as directed by customer. Note 6.Plans under $300 are subject to a $10 shipping and handling surcharge. The surcharge will be deducted from payments with the balance applied to purchasing your selected product. 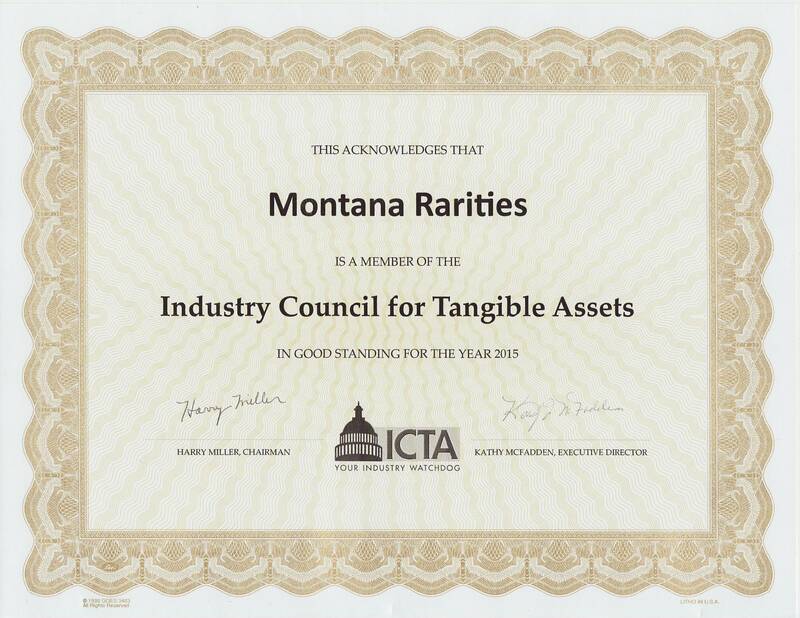 Montana Rarities is not selling a regulated product or securities, and offers no guarantees or warranties. Buying platinum could result in losses, as markets can be volatile, and there is a significant spread between Buy and Sell prices. Fractional platinum coins (meaning platinum coins containing less than 1 troy oz of platinum) carry higher premiums than buying platinum in 1 oz increments. If you plan on spending only $500 a month to buy 1 troy oz platinum coin or bars for the Plan please be aware that it may be months between shipments. By authorizing your Bank, Paypal or your Credit Card issuer to pay Montana Rarities under this Platinum Purchase Plan you are agreeing to purchase platinum each month in the form and amount you chose when you subscribed. You understand and agree that the price per ounce you pay cannot be predicted or guaranteed, and the quantity of platinum purchased each month will fluctuate. You agree that in the event of a dispute your only recourse is to cancel your subscription and receive a refund for the most recent purchase subject to the following: If a purchase is in progress the shipment will be canceled and your payment refunded. If a purchase is in transit or already delivered you must notify Montana Rarities of your intent to cancel within 14 days of delivery. You may then return that purchase and your payment will be refunded on receipt. Once 14 days have passed since delivery, the sale is non-refundable. If you have any unanswered questions feel free to call or Email Me.